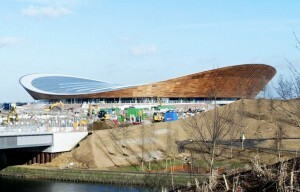 The 2012 Velodrome Olympic Stadium in London has just finished construction, and the stunning design by Hopkins Architects features both clean lines and sustainable features. Spotted on Designboom, the Velodrone is the first of the “big-five” large projects to be completed for the games. With natural cooling, water harvesting and daylighting seamlessly integrated into the program, this structure bodes well for both green design and energy savings. The 2010 Vancouver games gave us some ground breaking green projects so we look forward to see how the 2012 facilities turn out. 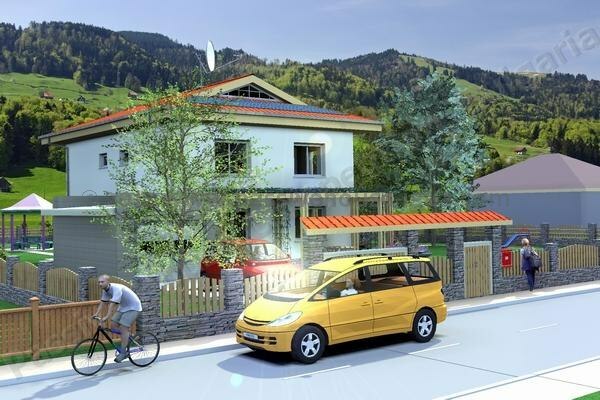 The beautiful saddle-like building was carefully engineered to be simple to construct with lightweight materials, and the construction takes advantage of use natural resources to operate as a calibrated, elegant whole. The striking white roof has rows of skylights crossing the complex, providing daylight and allowing overhead lights to be off during the daytime. The white roof is made from a net of cables supported by the surrounding steel super structure and will deflect the summer sun during the games thus reducing the cooling needs. The cedar-clad skin is perforated to allow convective cooling of the interior. Air flows across the 6,000 stands of seats and through the top, being replaced by cool, fresh air from below. The roof collects rain water as well, which is stored for later use in the faculty. 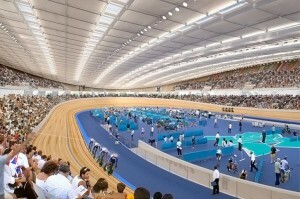 The bike track is expected to be the fastest in the world, furthermore designed to evenly distribute noise from the cheering crowd to keep from distracting riders. Thanks for reading our post and comment, as well as for posting this greening video! Awesome way to encourage people for recycling!